When driving around at the weekend, looking for wallpaper for the toilet, which I have to say is very exciting…not! I really wish I had shopped in the UK, so far everything I have found is old and boring…anyway, I drove passed this…. 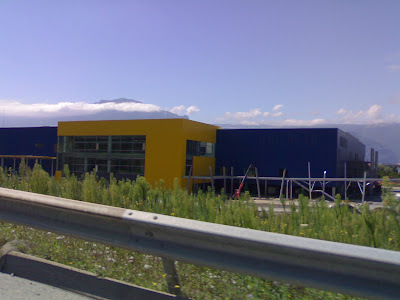 ..can you guess what it is going to be, yep, an Ikea, I have to say looking a little bit out of place, all blue and yellow in amongst the green, but hey, it will save a trip to lyon, almost an hours drive and almost 20euros in tolls, pity its not open yet as I really need two new beds, never mind, roll on October. After my spinning lesson with India, I came back home and unearthed a cheap spindle I had bought a while back and decided to have another go. It was great, I am really hooked, only problem is I now really need to have a wheel. I am having a little problem with an ebay seller and I HATE this kind of conflict, I hope it gets sorted soon as its making me feel very sick. Anyway this is my new yarn, cool huh? The stuff on the right is my second attempt. Don’t know what kind of fibre it is, as I had bought the roving from Fyberspates to do some needlefelting with as I loved the colours, its a little scratchy, but I like it, probably won’t knit anything with it but I can look at it. More unpacking on the agenda, still need some storage stuff in the kitchen, wine rack etc. Need to make curtains for the boys rooms and hang my bedroom and the living area curtains. The living room/dining room has 10 window panels that measure about 5m total or just under, so for winter I need HUGE curtains, for now I just have cotton panels for each one, simple and light, but I don’t love them so they won’t last…. good lookin’ yarn – hope your Ebay problem gets resolved soon. I have had a problem or two on eBay, including a time when I bought a large cupboard and ended up paying more for shipping than for the cupboard, which was not cheap. They didn’t insure it, even though I offered to pay for insurance, and it arrived damaged. On the other hand, I’ve had more good luck than bad with eBay and I can’t stay away! I hope your ebay issues sort them selves out soon. I love the colours in your handspun – it’s lovely when you can see progress in your spinning. My first lot was awful but it does improve! At least a spindle is more portable than a wheel. Lucky you to get a new Ikea – October’s not too far away now! The yarn is really pretty, before you know it you’ll be spinning fine yarn… and then you’ll have to re-learn how to spin the arty lumpy stuff again! Spindles are great though. I still use mine because it fits in my pocket.